Persistent or retained deciduous (baby) teeth occurs when the baby teeth do not fall out when they are scheduled to. Often times, you can often see the baby teeth in place right on top of the adult teeth. Causes include genetic, nutritional, or hormonal reasons. A general rule of thumb is "no two teeth should occupy the same spot at the same time in the same mouth." The persistent deciduous right upper canine tooth is pictured here with the adult tooth in front of it. In general, persistent deciduous teeth should be extracted promptly. When deciduous teeth fail to fall out in a timely fashion, adult tooth eruption can be affected. The adult teeth may fail to erupt or may come in at an incorrect angle and cause an orthodontic malocclusion. Even in cases of persistent deciduous teeth in which obvious orthodontic malocclusion is not evident, prompt extraction is necessary. Two teeth occupying the same space are crowded together and allow for increased bacterial and plaque retention. Food and debris easily collect in these hard to maintain sites, thus predisposing the site to periodontal disease. 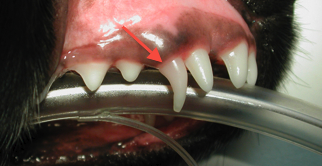 If you are unsure whether your pet has persistent deciduous teeth, ask your veterinarian. The timing when baby teeth fall out and when adult teeth come in varies greatly from breed to breed.